NOTE: Now Premium Plugin is available for everybody on WordPress.org. Enjoy 🙂 – Download. 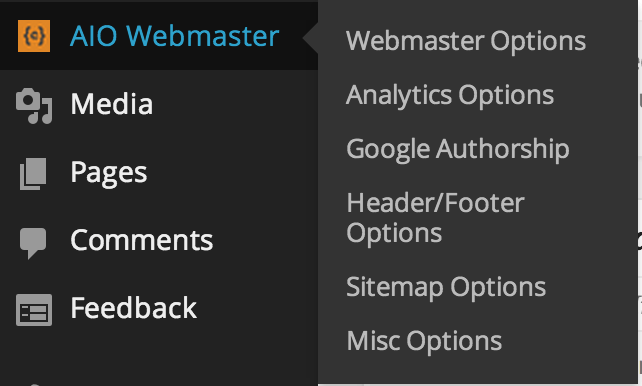 We are very happy to announce All in One Webmaster Plugin. If you already know about the word SEO then you probably know about such webmasters tools like Google, Bing, and Yahoo. These tools help us to rank well in search engines just by getting a copy of our blog sitemap therein webmaster central. Doing this, the robots of these biggest search engines sit in our blog database and whenever a new is published there in our blogs these robots knock the search engines about the new posts and get our posts indexed. Single click sitemap submission to Google and Bing. 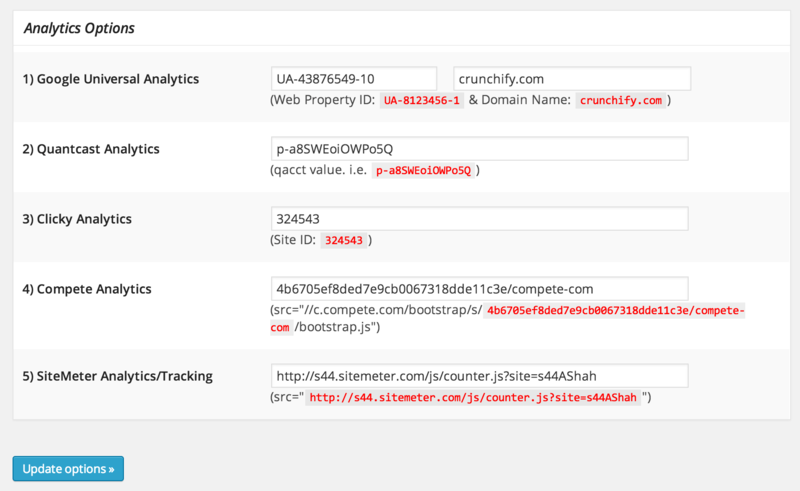 In addition to that it has option to add tracking code for Clicky, Quantcast, Compete.com, SiteMeter.com analytics!! Site-Verification-Option, Google XML sitemap submission. There are more to come in next releases. Brand new WordPress Menu bar with Webmaster Options, Analytics Options, Google Authorship, Header/Footer Options, Sitemap Options, Places Analytics. This section let you add Meta Tag for Google Webmaster Tools, Bing Webmaster Central, Alexa Rank, BlogCatalog Analytics, Facebook Insights. This section adds Meta Tags / Required Scripts Automatically to your WordPress Blog’s for Google Universal Analytics, Quantcast Analytics, Clicky Analytics, Compete Analytics, Sitemeter Analytics. You don’t have to worry about putting these script to your theme again and again in case you change your theme. This section adds Google Authorship Profile and Google Authorship Page Meta tag to your WordPress blog automatically. Again you do not need to worry if you change your theme again. This Header and Footer Section from All in One Webmaster Premium lets you to insert whatever you need in to the head and the footer parts of each blog page and before and after the content of posts. The first step to getting your site online and to get better rankings in Google is to submit your URL to search engines. An example of an URL is www.yoursite.com. Eventually the search engines will find your site but this will help expedite the process. This section will let you submit your sitemap explicitly to Google and Bing. A favicon (short for favorites icon), also known as a shortcut icon, website icon, URL icon, or bookmark icon is a 16×16 or 32×32 px in size. Just provide a URL of your favicon and plugin will do the rest of the work. How to find Meta-Tag values? Sitemap Submission Option to Google & Bing. Now no need to install more plugins. You can just copy the code of any services in a textarea. No more things to do. WHERE TO FIND GOOGLE, BING, YAHOO WEBMASTER META TAG? Visit links provided in All in One Webmaster -> All Options to get your META tag. This is an easiest way to authenticate your sites. Find an Account ID, starting with UA- in your Google Analytics’s Account overview page. I HAVE UPDATED ALL MY OPTIONS BUT WHY AM I NOT ABLE TO AUTHENTICATE TO SITE OR DON’T SEE ANALYTICS? I assume that wp_head() and wp_footer() are there in your theme. According to the WordPress documentation both functions are theme-dependent which means that it is up to the author of each WordPress theme to include it. If one of the hooks is not in your theme, you could add it yourself by adding <? php wp_head(); ?> to your header.php file of your theme or <? php wp_footer(); ?> to footer.php. If you still have problem then try to clear your browser cache, update Admin Panel option and retry. HOW CAN I ADD MORE SERVICE META TAGS WHICH ARE NOT LISTED HERE? No worries. 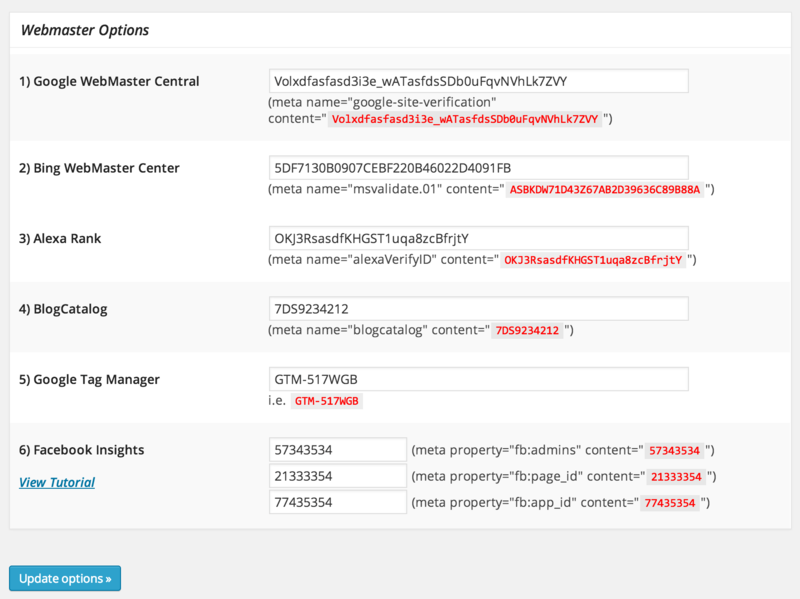 You can add those service’s HTML code into text area provided in admin panel. Please could you provide a link for me to explain how I get the Facebook meta information? I’m really struggling to find anything that explains where I find that information. Thanks for suggestion. Added to plugin’s TODO list. Im having trouble login into my facebook please help me. Hi Vijaya – which server you want to verify? Can you share screenshot? I found Pinterest verification tag from source code to put in All in One. I loaded this plugin to rectify following issue. My website is http://www.oratechsolve.com. The PageSpeedInsight is showing 6/100 for desktop and 48/100 for mobile. Before it was showing 80/100 for desktop and 70/100 for mobile. I am not sure what went wrong. Any idea how to fix that? Hi Stilfx – I didn’t quite get your question. Could you please share Admin Panel screenshot for better understanding? Position: is set to 6. The (Admin > AIO) button falls just below Posts, for whatever reason. Optimally, this plugin’s button would locate below Admin > Settings..
Could you please create a filter, to add an optional setting, or offer a solution so the plugin does not show up after “posts” in the left admin menu? …All In One Events Plugin was also set to position 6, and since AIO was position 6, Events would simply conflict and disappear. So, to workaround, if I change AIO to position 20 (or something other than 6), there is no longer a conflict and Events show up. However, any time the plugin is updated, obviously my change is lost.. Thanks stilfx. I’ll release new version to fix this conflict within a week. I love you’re style 😉 Thanks! Hi Gitte Hansen – i believe you need AppID not a PageID. You could get an AppID from facebook developer page: https://developers.facebook.com/. Then Apps => Add a New App Option.